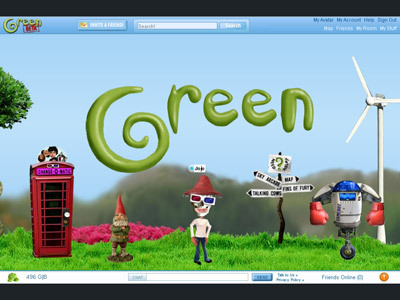 Green.com is geared for kids in the age range of 8 - 13. 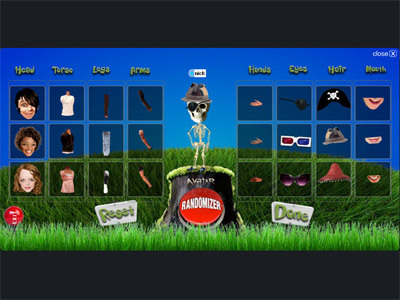 Playful graphics, intuitive controls, chat filters, customizability, fun games, etc. were all designed with this in mind. 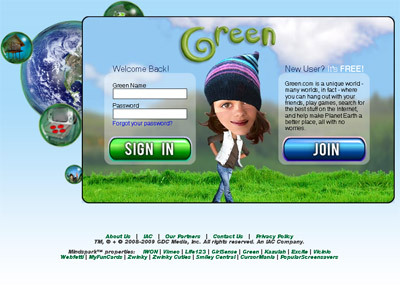 Green.com uses seamless integration of Flash, HTML, and Java for handling the virtual world and social network. At any point in time, you can transport to other primary locations using the map. Other locations require finding hidden portals to access. Full rooms are handled by creating new dimensions of that room and instances of objects in that room. 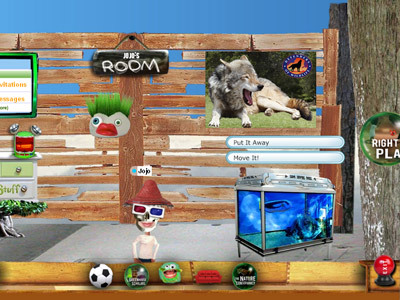 Your avatar is controlled using both the mouse and keyboard to allow for more control and higher level interactions with other avatars and objects. 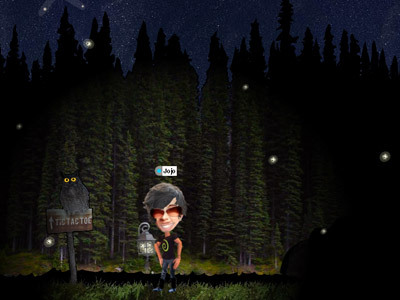 NPCs (non-player characters) can be found in many of the worlds. Clicking on an NPC allows you to have conversations with them. Logic is built in so that NPC interactions can be quite diverse. Your avatar has the ability to fly which adds to the excitement of exploring each world you find. There are a couple of different ways to chat with friends. 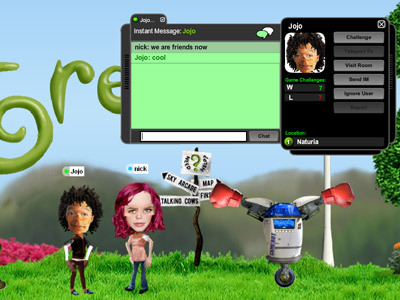 You can chat with everyone around you, you can IM a friend (no matter where they are), and for young users, you can pick from a list of approved comments. Everything is run through a chat filter to help prevent foul language and passing of personal information. 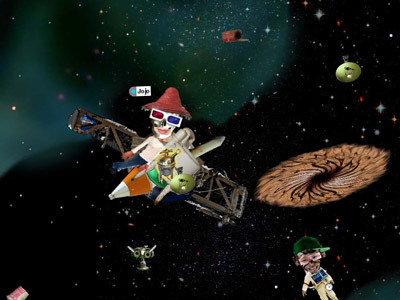 Several arcade style games can be found through Green.com. 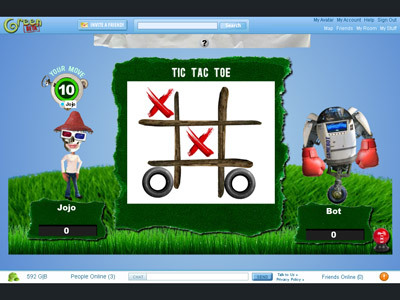 You challenge a bot in games like Tic-Tac-Toe. 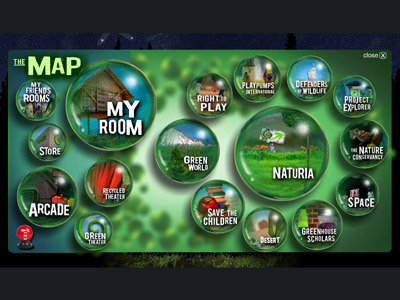 Several in-world games exist that can be played while exploring Green.com. As an example, the Space World has one where the objective is to pick up space trash and dump it in wormholes faster than your friends. 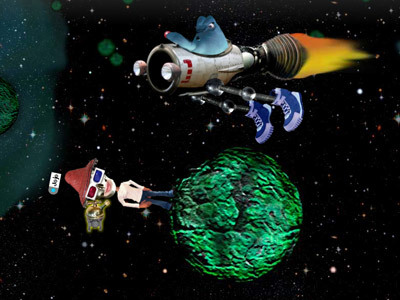 The physics engine is set up to handle different physics for each world and also proximity physics such as walking around a small planet in the Space World. Objects can create forces to affect the physics around them. The horn in Naturia is a good example of this. Click the red button to arm it and then walk onto the X to be launched up into the sky. Platforms can also be built to allow for islands in the sky, walking on a walls, and boundaries for a maze. 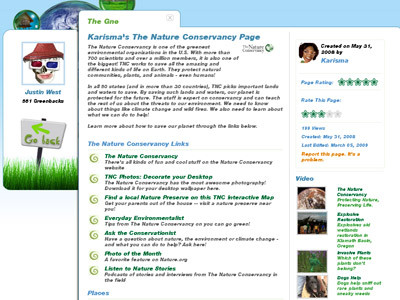 Each of Green.com partner companies have a site dedicated to their cause. Each also has a bulletin board that shows the latest news, facts, and videos for that partner. The Firefly World was completely designed and developed by me. I used all of my own photos to create the world. At the start, everything but the sky is black, but as you gather fireflies, your lantern glows and you can see more around you. I also used video of a fire to add more light to the surrounding area and to add interest and motion. You can also play an in-world game of Tic-Tac-Toe up in the sky with other avatars in the room. 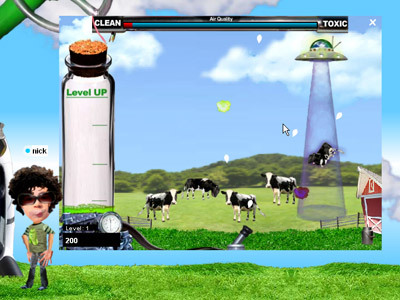 Here is an example of one of the in-world videos. There are a couple of worlds that are movie theaters. 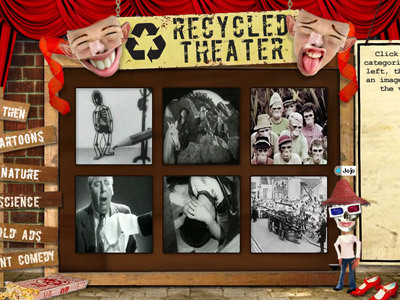 You can pick from a whole list of different themed videos to watch. 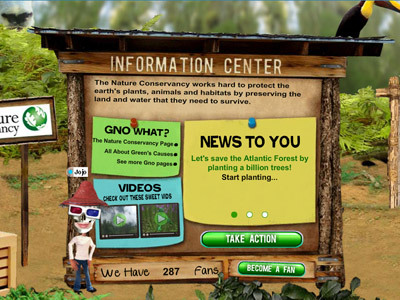 The Gno is a place where you can go to learn more about any number of number of topics. Each Green.com partner also has a gno page of their own for promoting their cause. To leave messages with friends, see what your friends are up to, and control general friend stuff, we built Friend Central. It's all built outside of Flash but tie in seamlessly with the virtual world. 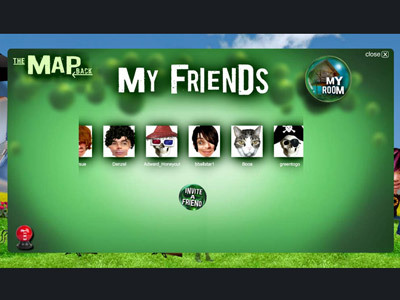 All of your friends can also be accessed through the My Friends map. Click on a friend and it takes you to their room so you can see what they've been up to. 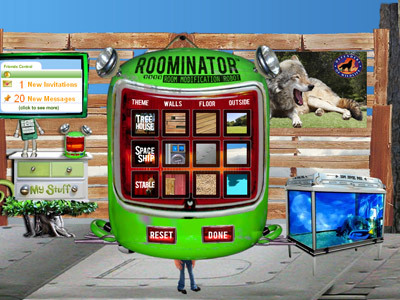 Not only can you customize your avatar but you have complete control over what your room looks like. You can pick from several different themes or mix them up for a style of your own. You can also decorate your room with objects that you found, won, or bought with GreenBacks (Green.com virtual currency). 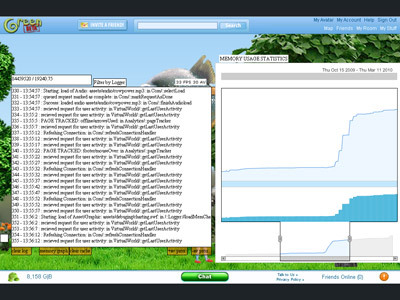 A Logger was built to help track memory management and error reporting for live bug testing. The first thing I created for Green.com was the SyncManager. This was used to build the logic and dialog behind all NPCs and objects in Green.com. It was also the primary way to sync up the narration and audio for each NPC. 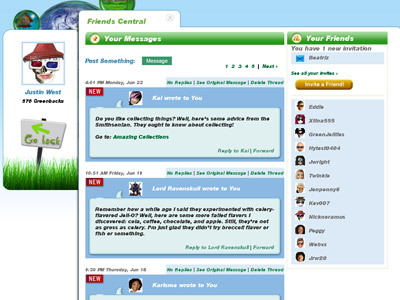 Green.com was built to be a unique online virtual world and social networking site where kids safely gather, learn, and interact with each other. With the help of Green's partners, Green.com teaches children and tweens the importance of protecting our environment in fun and engaging ways. 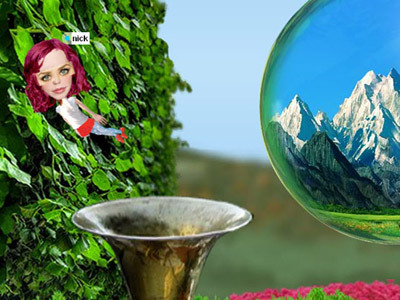 This virtual world includes beautiful landscapes, rich avatar interactions, multiplayer games & missions, live chat and messaging, synced physics, content management systems, and the list goes on. 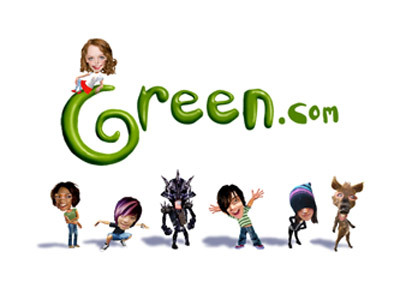 Many involved with Green.com have helped build well-known products and companies such as: The Muppets, Citysearch, Ask.com, Match.com, and Earl Weaver Baseball. I highly recommend that you watch the entire video demo I put together. In partnership with: RightToPlay, Defenders of Wildlife, GreenHouse Scholars, Save the Children, Project Explorer, The Nature Conservancy, and PlayPumps International. Justin brought more to the table than what was asked of him. He constantly looked for ways to improve delivery on our expectations, working as an integral member of the team. Our product and design people requested Justin when being assigned a technical resource. Justin worked remotely, and stayed in rhythm and in touch with our business better than many of our local workers. He is a trusted, creative, and execution oriented individual who proves his worth time and again.